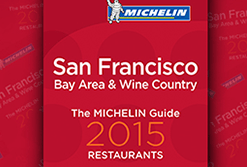 As you may know, the list of restaurants in the Michelin Guide 2015 – San Francisco Bay Area & Wine Country. was announced October 21, 2014 in San Francisco. As foodie, I am always thrilled to hear the news. And just in case you want to mark your calendar for NEXT year, expect to hear about Next Year’s Michelin Guide in mid October a year from now. As far as THIS year’s Michelin Guide goes, there was a POSH gala in San Francisco where the Michelin Guide 2015 was first made public. It was quite the swank affair and details are available here in my previous post. For those who want the full list of Michelin Guide 2015 Restaurants at their fingertips, please find it below. Michelin Guide 2015 – Three Stars – Exceptional Cuisine. Three stars, the highest rating, is given in recognition of exceptional cuisine. It identifies restaurants where diners are met with distinctive dishes, precisely executed with the utmost in fresh, distinguishing ingredients. Michelin Three Star establishments are destinations in and of themselves. Michelin Guide 2015 – Two Stars – Excellent Cuisine. Two stars are given in recognition of excellent cuisine of outstanding quality. Dishes are crafted with obvious skill and care. Michelin Two Star restaurants are worth a trip off the beaten path. Michelin Guide 2015 – One Star – Very Good Cuisine.One star is given in recognition a very good restaurant in its particular category. It acknowledges cuisine prepared to a consistently high standard. Michelin One Star establishments are most certainly restaurants worth a stop. We are so fortunate to live here in the San Francisco Bay area with access to such world-class restaurants. Please get out and enjoy these gems and drop me an email with your favorites – I’ll see about doing a featured post about them! Photo Credit – Thank you to the Michelin Guide for the use of their photo of the 2015 San Francisco & Wine Country Restaurant Guide.